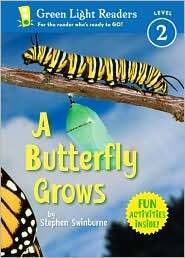 Kindergarten-Grade 2 - Straightforward vocabulary, short sentences, and crystal-clear photos combine to provide a brief overview of a butterfly's life cycle. Information is presented in story format, with the creature offering a first-person narration that occasionally rhymes: "Rain falls. It plips and plops. I need to drink water. I drink the small drops." For the most part, the crisp close-ups directly follow the text, illustrating the highlighted details. However, the narrative states, "I grew in an egg. Then I hatched," a process not shown in the photos. On another page, the text reads, "Look at me now! I am an insect. I have six legs," but it's difficult to count these appendages in the accompanying picture. Still, the book's pleasant narrative flow and appealing full-color photos will captivate and encourage beginning readers. "What Do You Think?" questions are appended. An eye-catching addition to easy-reader collections. Joy Fleishhacker, School Library Journal END --This text refers to the Hardcover edition. From the Green Light Readers series, this book begins with a caterpillar. In short, childlike sentences, the little larva tells of hatching from an egg, hanging onto a branch in the wind, drinking small drops of rain water, eating leaves, growing, and becoming a chrysalis. After 10, days the butterfly emerges, saying "I like to fly with all my friends. Wings help us play. Wings help us to go find plants for food." The text is clearly written and appropriate for beginning readers. Colorful photos offer excellent views of butterflies in three stages of their lives. Though the cover promises "Fun activities inside!" few children will consider the four appended questions fun. Still, given the many beginning readers who prefer nonfiction, this will be a good addition to many collections. Preschool-Grade 1. --Carolyn Phelan --This text refers to the Hardcover edition.